English: Bonesetter, Devil's Backbone, Veldt Grape. Sanskrit: Vajravalli, Asthisrinkhala, Kulisa, Asthisamharaka. Climber vine, rambling shrub, herbaceous, scandent, sprawling with jointed stems. The stem are edible, similar to joint bone. 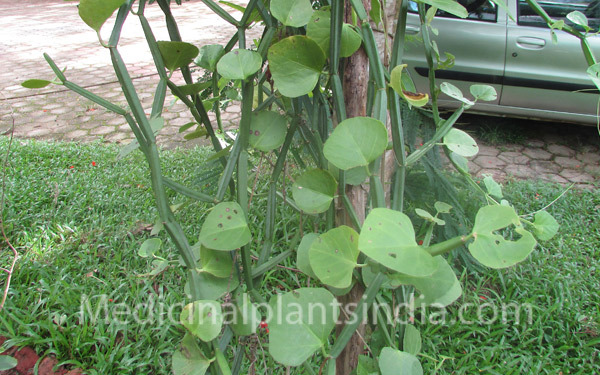 It grows up to 2 m in length with the help of tendrils, and square shaped branches with interns nodes, up to 10 cm long. Leaves are rare, arranged alternately, heart-shaped, reniform, margin entire, and sometimes toothed, three-lobed and 5 cm. long, which appear at the nodes. Flowers are small and white or yellowish or greenish yellow, fruits or berries are globular and turn red when ripe. It is also used in the treatment of feminine disorders such as menopause, libido, and menstrual problems. It has been used in ancient times in the treatments of bone injuries, relives torn tendons and ligaments. Plant contains proteins 12.8%; fat and wax 1.0%; fiber 15.6%; carbohydrates 36.6%; mucilage and pectin 1.2% on dry basis. A yellow wax, tartaric acid and the acid potassium salt are present. The plant is remarkably rich in vitamin C. Calcium oxalate crystals account for the irritating action of fresh stems, and 5-amyrone, resveratrol, pallidol, parthenocissine A and piceatannol. Tonic, analgesic, antibacterial, anti-fungal, antioxidant, anti- inflammatory, anthelmintic, Aphrodisiac, and carminative.